From internet we managed to find rather splendid looking maps of the battle which included the all important elevation levels clearly presented. Since there was plenty of elevation levels we did a small size (A4) miniature of the terrain to give us a clearer 3D picture of the battlefield . With it we would be able to use if as a reference during the construction of the actual terrain. Also it would give us advance view of what the terrain would look like. We decided to build the terrain so that it would fit on top of our larger regular gaming table and have just some room to spare. 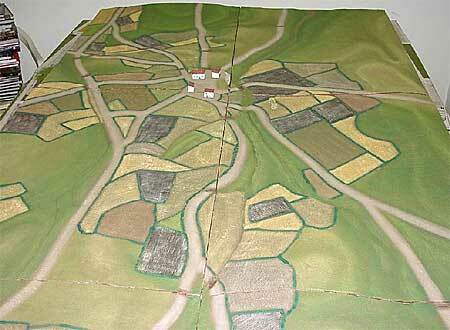 We thus settled to the size of 270 x 130 centimeters (9 x 4 foot). Since we’d still be playing other scenarios every now and then the terrain needed to be easily removable. 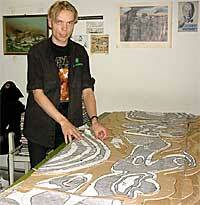 Thus we decided to divide the terrain into 6 sections each of them being 90 x 65 centimeters (3 x 2 Ft.). The terrain also needed to be sturdy enough to withstand at least some rough handling during transportation but also it needed to be light enough to be easily handled. The light weight would also enable the terrain sections to be stackable during transportation requiring thus much less space. 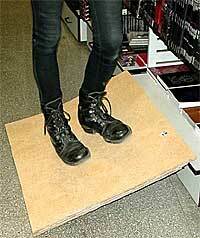 The base material on top of which everything else was to be build would be inexpensive hardboard. The elevation levels would be built from cardboard boxes since we could get an endless free supply of it from Fantasiapelit. Doing mock-ups of the map’s steepest climbs we did some trials with miniatures to test how thick the cardboard elevation levels (and thus how steep the hills) would be before the models would keel over. We found out that 4 millimeters would be most suited for our needs. We’d enlarge the map to our table size and then print it on A3 sheets which would be taped together. From this print we would cut out each elevation level at a time, apply cut-outs on top of cardboard, trace their shapes and cut the cardboard to these required shapes. These cardboard parts would then be glue on top of the hardboard base and one another with PVA glue. After all levels were applied the edges of the step-like terrain would be smoothed and made more naturally rounder with filler. When this was dry sand would be applied with PVA to give texture and finally everything would be painted. Buildings and vegetation would be removable so during game play they could be moved from the miniatures way when needed. Also while in storage or during transportation the space the terrain needs is also much smaller with removable forests etc. Truth is nothing ever goes exactly according to a plan and we of course had to resort to several ad hoc methods to make everything work. Nothing major though but small things here and there. First off, cover your working table with at least a layer or two of newspaper pages or something similar. If you do not have a separate hobby area like our club room you most probably will have to go to much greater lengths in protecting the working surfaces. We found out that tabloid sized free “newspapers” like Johnny Kniga work just fine and dandy. We actually invented a new verb “kniga” because of this. To kniga something means to cover it with newspaper. First problem was encountered almost immediately. The cardboard we were going to be using was Games Workshop shipping boxes since there is a never ending supply of these at Fantasiapelit and as they are all from one source they are of the same material. Unfortunately the thickness of this material was 6mm instead of 4. The sample piece that we had measured during our brainstorming session had apparently been something else than a GW box. Using 6mm thick cardboard the way we had originally planned would have been impossible since it was 50% thicker and this would’ve rendered too many of the hills too steep for the miniatures making the terrain difficult to use in actual gaming. Because of this we decided to drop every other elevation level. The terrain shapes would still be there but perhaps they wouldn’t be as pronounced as they would’ve been with 4mm thick cardboard. Tough. First we divided the print of the map into six sections the same way we had divided the large hardboard into six smaller ones (actually while buying the hardboard we had asked the DIY store to cut the pieces for us as their cutting is more precise with the equipment they have). Starting from the first elevation level we cut each level from the map with scissors. 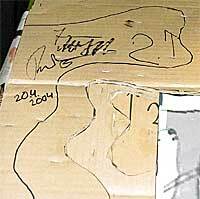 Then we lay these on top of cardboard, traced the edges with a large felt tip pen and cut the cardboard with a retractable knife. Remember to do this one level at a time so you do not get piles and piles of cardboard cut outs and no recollection where they should go. It is extremely necessary to number each segment of the board (i.e.. segments 1-6) and mark each segment of the printed map and each cut out level of the map and cardboard with the corresponding number. Drawing an arrow indicating north next to these numbers doesn’t hurt either (7). This helps tremendously when figuring out where each cut piece of cardboard should be going (8). After having cut out a level from the cardboard they were glued into place with PVA glue (9). With larger pieces you will have to work quickly as even PVA will dry from the surface fairly quickly when applied to porous material like cardboard and if this happens the cardboard won’t adhere properly to the level below. 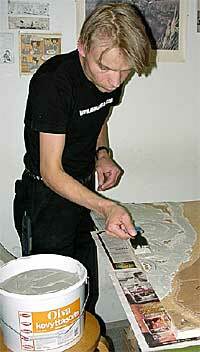 Since PVA takes time to dry properly and thus take hold the cardboard pieces will often pop open from various edges. To prevent this we used a stapler gun to lock the cardboard pieces to previous levels until the PVA glue dried. After stapling we applied weights on top to make sure the cardboard stayed in place until dry. We used weighty D&D tomes from White Wolf and WOTC. When using this kind of material, that you do not want to get any glue stains etc. into, as weights you’d better cover (or “kniga”) the surface first with newspaper. 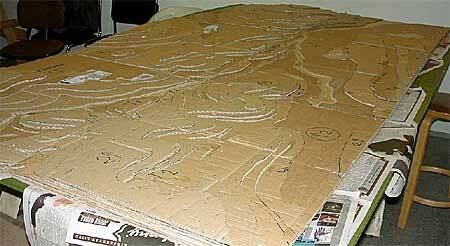 With the first level almost the whole hardboard base would be covered with a layer of cardboard, excluding the small ravine of the river. With each progressive elevation level the pieces got smaller and smaller and when they were suitably small hotgun could be used for gluing the pieces into place. This is because glue from a hotgun dries very quickly and thus you are unable to cover anything but rather small surfaces with it before the glue has dried out in other parts of the piece. Do remember to use the pieces of the printed map to mark the placement of next level. Just lay the cut out piece on top of the previous level that is already on its place and mark it with a large felt tip pen.This way the next piece is bound to find its right place when you have cut it out! When applying pieces that have at least part of them in contact with an edge of the board it usually is enough just to mark the piece’s contact points with the edge, not the whole shape of the piece. When applying the cardboard elevation levels remember to finish the elevation level on all sections before moving on to the next elevation level. This way you can easily check that the elevation levels in different sections interconnect the way they should. You can also check how the sides of the sections fit into one another so no gaps are created between the sections when you place them next to one other. You don’t have to be too exact though, this is still rough work and you can fine tune your work later on. When you have finished working on the elevation’s last section the first one might already be dry enough for the construction of next level. Did you know that when PVA glue dries out it shrinks somewhat? We did but were confident that this would be a problem. Boy were we wrong! After each layer had dried out the whole section would’ve warped at least somewhat, sometimes quite a bit. When there was only a couple of layers of cardboard on top of the hardboard you could unwarp them by turning them upside down, going on top of the sections on your knees and pulling on the edges until the sections became more or less unwarped and even. When plenty of levels had been applied this became an impossibility so we had to unwarp them by placing the sections so that they lay partly on the floor and partly on shelves (i.e.. other end was leaning on something that was somewhat higher than the floor) and carefully applying your whole body weight on top of them. Warning: lean and athletic Gemigabok gentlemen weighting some 65 kilos (130 lb) apply different pressure than persons with weightier bulk so you might want to be careful so as not break the sections. Finally the warping became so bad that we were unable to completely remove the warping. As we were going to use filler to even out the rough terrain shapes made by the cardboard levels we knew that the cardboard would get somewhat wet which would also cause warping. As filler isn’t that flexible we feared that unwarping after application of filler would cause the filler to chip off at least somewhat. To prevent this we paid yet another visit to the DIY store and bought some small wooden planking which were screwed into edges. To avoid getting blisters in your hands we recommend the usage of power tools and sometimes it helps to have a buddy to press the terrain tightly into the reinforcement. Originally we thought that it would suffice if these reinforcements were applied to the shorted sides of the sections but soon it became apparent that the longer sides needed reinforcements as well. We hadn’t bought enough material for this and being lazy made do with what little extra material we had. We also noticed that you can only apply the screws from the top side (ie. the head of the screw is on the side of the hardboard) as hardboard is too thin and fragile that the actual screw will brake it immediately if applied from the bottom. We fastened the reinforcements after many levels of cardboard was already in place with little problems (just some gluing breaking in the middle sections as the sections became unwarped but this was pretty easily fixed with the application of more glue and weights on top of the areas being fixed) but in the future we’ll do it before any cardboard is applied or after the first level. We’ll also be reinforcing all sides of the sections completely and perhaps even adding a diagonal reinforcement in the middle. The reinforcements aren’t fastened to the exact outside of the sections but a centimeter or so inward as to avoid having the reinforcements of different sections contact one other thus causing possible gaps between sections. Better safe than sorry. Finally came the time to apply the final piece of cardboard and everyone involved signed their name on the board below and then the final piece was applied with much rejoicing! 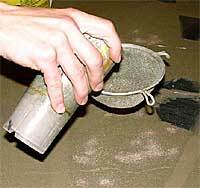 To smoothen up the terrain we had bought some lightweight ready mixed filler. It was only marginally more expensive than the regular brand but we figured that making the terrain sections weight as little as possible was more important than the very small price difference. Several brands are available but we do not think there is much difference in these. You can also use filler you need to mix yourself, like plaster, but using ready filler is much quicker and straightforward and less messy to boot. Originally we had planned to apply only some filler to the edges of each elevation level to remove some of the unnatural step like effect. This way during the game it would be very easy to see which units were on higher elevation than others. Of course holes and gaps were filled as well. After the application of the first layer it was decided that we would however aim for more realistic look and began applying several more layers with larger spatula after the first layer had dried. All in all it took some three applications of the filler to get the effect were were after. Be sure to let each layer dry out first before you apply the next one. Around this time we also noticed that we hadn’t been too careful in getting the sides of the sections straight. Some were leaning outside and some inside. Removing the extra cardboard was easy by sanding the edges with rough sandpaper. Adding some extra material was done with adding some cardboard with PVA glue and duct tape. At the same time we checked how the elevation levels of the different terrain sections connected to each other and fine tuned them with filler. 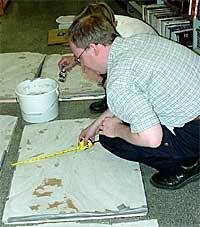 We also filled the few small cracks that had appeared to the filler layer when it had dried. Most probably those would’ve disappeared when the texture (sand) was applied but we didn’t want to take the risk of having the cracks visible. A word of caution on the usage of duct tape. The surface of duct tape is quite greasy which will cause some problems when trying to get other materials to stick to it. If you need to apply filler on top of duct tape remember to make it a thick layer as thin layers will most likely break off at one point or another and you’ll have to do some touch up work. All in all using masking tape instead of duct tape might be much better idea. Now it was time to apply the texture to the terrain. We thought of using the Woodland Scenics method we had already used some years ago while making terrain for a small Waterloo terrain, but even though the results look very pleasing this was too time consuming a process to be applied to this large a terrain. So we decided to use sand for the texture. This meant that we also had to paint terrain. This was not really a problem as the paint would also bind the sand to the surface a bit more making it less easy to chip off during playing and transportation. After the filler had dried we traced the roads onto the terrain with a pencil. It was decided that the roads were going to be over sized compared to rest of the terrain (as quite often the miniatures themselves are) so that when miniatures were on the road as a column the effect would be much more pleasing than if we had used the realistic road width which would’ve been just some millimeters. We mixed some PVA glue with water to make it runnier and thus prolonging the time it took for the glue to dry. 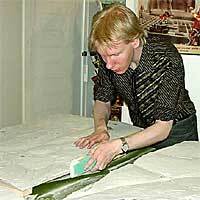 The glue was applied with a one inch brush to the places where the roads had been traced, excluding fords. Glue was also applied to the site of the town of Albuera as we could thus easily distinguish the town limits during the games. On top of this very fine sand was poured. This sand actually came from a tape stand where it had been used as weight. There were plenty of these stands lying around in Fantasiapelit as at one time it had cost the same to buy just a roll of Scotch tape or a roll with a stand. Next we traced all the fields to the terrain. Usually most of the terrain one sees is just grassy field of continuous green. We wanted to give some variation to the large terrain by having plenty of different colored fields in it. To get our point just look at the terrain below you the next time you fly somewhere. Also the map we had seemed to indicate the presence of fields and we used it to give us the shapes of the fields as well. A couple of fields were to be left in ploughed state and onto these areas we glued some suitably textured wallpaper with PVA glue. Then we applied some watered down PVA to the edges of fields and applied regular sand to these areas. 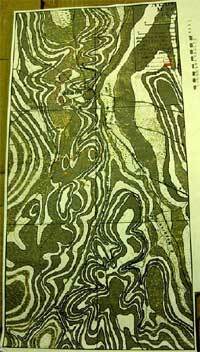 This way we could apply sand later on to the whole terrain without having to worry about the “disappearance” of the fields as the the edges of the fields would be noticeable as somewhat higher areas after the more covering layer of sand was applied to all non-road or stream areas. Granted we would’ve outlined the fields after initial covering of the terrain with sand but tracing on top of filler or cardboard is much easier than tracing on top of a layer of sand. 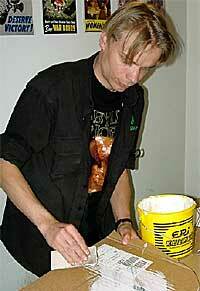 The sand we used was regular everyday variety that had been strained first to get rid of any too large bits in it. We also noticed that strainer was very useful when applying the sand to the terrain boards as well. Instead of just pouring the sand from a container we poured it through the strainer which spread in more evenly over the terrain. Note that you won’t be able to cover whole terrain section at one go since the glue will start drying in the parts it was applied first and thus the sand won’t stick to it. So you need to apply the sand one smaller area a time. To minimize the forming of edges etc. between these areas try to use roads and streams to limit the different areas and if this is impossible avoid using straight lines on the edges of the areas. Also worth of note is that you should try to apply the glue evenly since areas where glue is more abundant will stand out when you do the painting, especially dry brushing, as they have a thicker layer of sand in them. We noticed that a large terrain will eat up a surprisingly large amount of sand. Luckily sand is rather cheap material. 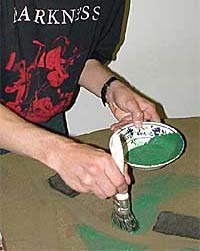 Invariably not all sand that you apply on top of the terrain will stick to the glue so sooner or later you’ll have to lay some newspaper on the floor, take the sections on top of them inverted and gently tap the under sides to get the loose sand from the terrain as it would greatly hinder the painting process. This loose sand can of course be used later on for texturing. While playing games on this terrain we noticed that the miniatures hold onto the sand much better than to other terrain surfaces we’ve used and do not slide even in the more steeper hills. Basically the whole terrain could be called one giant sandpaper! We picked up several pots of acrylic paint from the local DIY store in addition to the odd pots we still had left from various previous projects. The colors we used were mid-green, dark brown (the actual shade was rather reddish to our surprise), ocrish yellow, light beige or khaki. We also used some blue to darken the green a bit. We also noticed that a lot of water could be added to these colors making them last much longer but without losing their opaqueness. At first we wanted to give the whole sand texture a darkish base color so we painted the whole terrain over with much watered down dark brown. We aimed to give the terrain a brown wash so to speak which coupled with sand’s natural color would give us a good base color to work on. We also hoped to get a more spanish feel to the terrain by not painting it too green but also adding a lot of browns and yellows in order to achieve more burnt feel for the hot climate’s grass and ground. Of course the areas that were closest to the Albuera river and streams were to be more lush and of deeper shade of green as would be the areas of the forests. But the forests were not be be stand out too much so that if we wanted to use the terrain on some other games these areas could also be used as open ground without having them stand out as too dark. So on top of the brown wash we started applying dark greens to the forests and vicinity of streams gradually mixing the color to a lighter shade as we progressed further from the rivers. We also wanted to make the hills stand out more and added progressively more yellow to the green when painting the top parts hills. After all the green parts were painted and dry-ish we started dry brushing these areas with lighter shades to bring out the texture. We emphasized some of the elevation levels to bring them out a bit more clearly by over doing the dry brushing a bit on their edges. After the green parts were finished we started on the roads and fields and used different shades of browns, ochres and yellows which we also dry brushed. 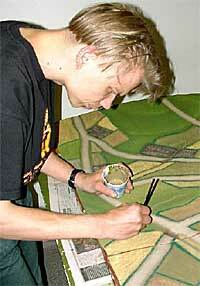 We then used small brushes to paint the raised edges of the fields with a dark green which was also dry brushed. Finally all the water areas were painted with a muddy earth color and varnished to give it a more glossy and watery feel. We also did some new trees and especially olive trees to be used as the olive grove in the vicinity of the river. We also built the bridge from thin cardboard using some photos of the actual bridge we found in the internet as an example. The bridge was textured with fine sand the same way the whole terrain was. For the town some buildings were also made from thin cardboard and filler. We didn’t build too many of these as the town would most likely be occupied by a unit or two during the whole game and too many buildings would’ve been just on the way. But without miniatures the few buildings sure make the town seem rather barren.